FEBRUARY 22, 2018 Practice tips, membership benefits, upcoming events, new products, and more! There’s a new group leading the charge when it comes to social media marketing. They are known as influencers, and their power can be mighty. These influencers have large or unique, niche social followings. Their recommendations on products and services carry a lot of weight with their followers. Major brands are recognizing this effect and creating partnerships with influencers to increase revenue. So what do social influencers have to do with the practice of law? We’re not going to get into the legalities of influencer promotions and endorsements. If you’re interested in that aspect, you should check out this CLE OnDemand seminar on the topic. We’re also not going to recommend that you start using paid influencer marketing to promote your practice, though you could. Instead, we’re going to look at how you can become an influencer in your own field and use that influence to build your client base. Know your niche. 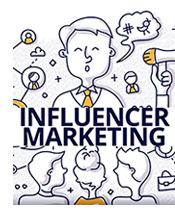 Effective influencers provide information on specific topics like health, beauty, travel, technology, cooking, etc. Pick an aspect of your practice you are passionate about and start there. It doesn’t have to have a huge following either, just an interested one. Be useful. Create social media content that is helpful and relevant to your niche. (This is where writing that blog comes in handy.) It also helps if you can provide this information in a unique way. Make sure you are putting your own thoughts and insights into the content. Share. If you find other articles, blogs, videos, or news stories that you think your followers will find interesting, share them. When you share someone’s article or blog, try to tag them in the post so they know you’re sharing their content. They will likely reciprocate. Engage. Invite followers, follow other influencers, and join social groups and online community forums. Like, comment, and exchange ideas with other people in the legal profession as well as your followers. Write for other sources. When other platforms quote you or publish your work, you gain access to new audiences and increase your profile. Check out helpareporter.com. This site matches knowledgeable sources with reporters writing stories. Or, look into contributing to State Bar of Wisconsin publications. When a prospective client does an internet search of your name, which it’s likely they will, they’ll find you showing up in multiple places as a leading voice in the profession. Take a look at these articles for more insights on developing your social media influence. It’s a complex world out there and it can be tough to know the right thing to do in a sticky situation. Hear from the man who wrote the book on ethics at the 2018 Annual Meeting & Conference. Professor Richard W. Painter will give the closing plenary. Painter’s passion for ethics has been an integral aspect of his career. 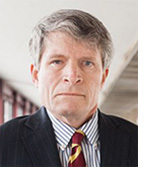 From 2005-2007, he was associate counsel in the White House Counsel’s office, serving as the chief ethics lawyer for the president, White House employees, and nominees to Senate-confirmed positions in the executive branch. He’s been active in law reform to deter securities fraud and improve the ethics of corporate managers and lawyers. A key provision of the Sarbanes-Oxley Act of 2002 – requiring the SEC to issue rules of professional responsibility for securities lawyers – was based on Painter’s proposals. He currently serves as a professor of corporate law at the University of Minnesota Law School. At AMC 2018, enjoy an engaging, high-level look at ethics in today’s world from a man who has devoted his life to improving legal ethics. Visit amc.wisbar.org to register now! We’ve given suggestions in the past on how to ask for referrals. Here are some thoughts on expressing your gratitude to the people who send business your way. Call them. It can be that simple. After taking on a client they referred, give them a call and let them know. Make sure to do it right away so you don’t forget. Treat them. Offer to take them to coffee or lunch. If you don’t live or work near each other, send them a gift card to a restaurant or coffee shop in their area. Include a handwritten note thanking them for the referral. Gift them. Try to go with something more thoughtful than a fruit basket unless they REALLY have a thing for pears. Send them a copy of your favorite book or make a donation in their honor to their favorite charity. Note: you should handle all referrals in keeping with the guidelines set out in the Rules of Professional Conduct. Learn more. Chances are if you’re practicing law, you or your firm have a website to help prospective clients find you. Most law firms in Wisconsin do. When reviewing your website, here are some things to keep in mind to ensure you’re getting it right when it comes to the rules. Know and understand the advertising rules. There are limits on the claims you can make. Disclaimers are necessary. This can affect the attorney-client relationship. Give general legal information on your website, not legal advice. Legal information is factual, generic, and does not propose a specific course of action. Be careful about chat and email. Again, this affects client confidentiality and forming an attorney-client relationship. Below are articles that can help you understand the dos and don’ts of websites. What Should Your Law Firm's Website Disclaimer Say? It’s been a great run, but all good things must come to an end. 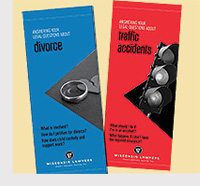 After nearly 70 years, we’re retiring the Consumer Pamphlet Series. That means big savings for you. Save 30% on all remaining print consumer pamphlet titles – while supplies last. * Use discount code PAMPHLET30 when you order online or by calling (800) 728-7788. Hurry – they’re going fast! *This discount applies ONLY to in-stock print editions of consumer pamphlets. It cannot be applied to electronic licenses, handbooks, or life planning guides. The discount also cannot be applied to previous purchases or combined with other offers. It’s $25 for Construction and Public Contract Law Section members, $35 for non-section members. Earn up to 1.0 CLE credit. Advanced registration is required by Monday, March 19. Join the Children and the Law Section for Learning Law at Lambeau: Tackling the Stigma - Children, Families and Mental Health at Lambeau Field in Green Bay on April 26, 2018. Earn up to 5.0 CLE credits, including 1.0 EPR credit. 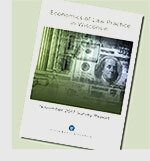 When making choices about your practice, look to the trends identified in the Economics of Law Practice in Wisconsin 2017 Survey Report. The report compiles and analyzes survey results from more than 1,200 lawyers across Wisconsin, including solo and group private practitioners, corporate attorneys, in-house counsel, as well as government and academic lawyers. Are you charging too much? Too little? Are you investing as much in technology as other firms or organizations? Find out how your practice compares to others and be inspired by the actions other practitioners are taking throughout the state. A few key survey findings were highlighted in this recent article in Wisconsin Lawyer™ magazine, and the full Economics of Law Practice in Wisconsin 2017 Survey Report is available now in both PDF or print book format. *This offer is not available with any other discounts and expires at midnight February 23, 2018. Discount applies to first time purchases/subscriptions only. It cannot be applied to previous purchases, auto-supplementation orders, or Books UnBound subscription renewals.